Solda transformed our backyard into an oasis..... from blah to ahhh in a short time. From our first meeting with Andrew Solda we were confident that the companys' values and work were consistent with our own. Our family couldn't be happier. Solda installed a beautiful in-ground pool, inground spa, deck, cabana, and complimentary landscaping. Communication was excellent. Both the outside and inside staff were always ready to help us with any question and/or concern. If you're looking for a one-stop shop, Solda will take care of everything from permits to pool maintenance. A for communication, professionalism and cleanliness. Thank-you! The secret to our success is our commitment to a Turnkey backyard solution. We enjoyed working with you to transform your backyard to your Oasis. 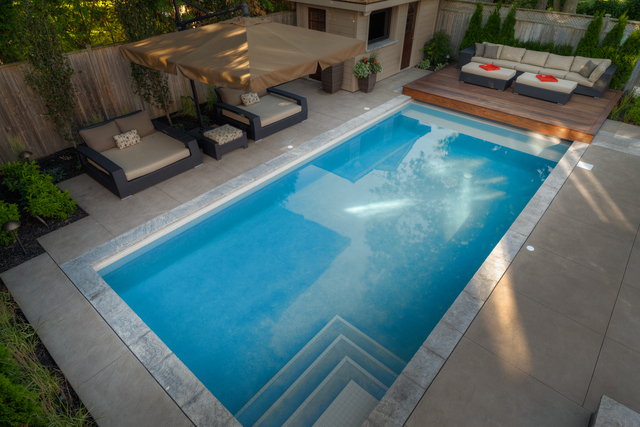 We look forward to assisting you with all your pool needs for many years to come. Happy Swimming! The Solda Team completely transformed our backyard into our own private resort. One stop shopping at a very competitive price. Our time is valuable and the Solda Team took care of “everything” from permits to pool maintenance. The communication and professionalism of the Solda team provided comfort during the entire process. We now have a backyard that we can enjoy as a family and we wouldn’t hesitate to recommend Solda to anyone who asked. Thank-you! We enjoyed working with you on your backyard transformation. It looks amazing. Enjoy your private backyard resort and happy swimming. 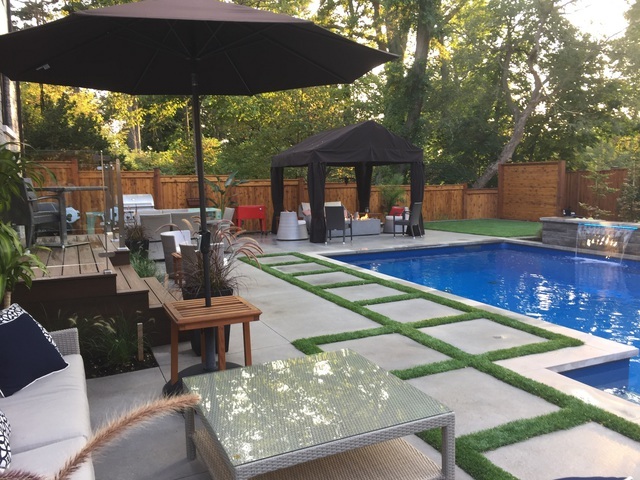 Solda Pools transformed the backyard of our new home into a beautiful space perfect for our family. This is the second project Solda has done for us and we couldn’t be happier. Amazing workmanship and a great staff. Truly a pleasure dealing with Solda Pools in every aspect. Thank-you Patricia! We loved working with you again. We appreciate the trust you have in Solda Pools. Happy Swimming! Solda pools installed our pool and we are thrilled with it. I had asked for a maintenance visit after my pool turned green, but then managed to fix it. I forgot to cancel the work order and when the contractor game, they saw no work had to be done and didn’t try to swindle us by duplicating the chemical treatment. When I called the office, I explained my error and they graciously waived the service call. They are honest and have great customer service, highly recommend. Thank-you Bassem for your continued business and kind words. 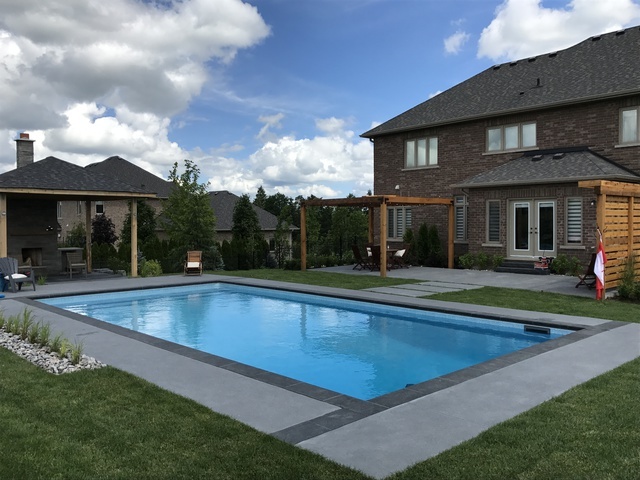 We used Solda Pools for our extensive backyard renovations and pool project this past summer (2017). We were very impressed with the quality of workmanship and attention to detail by everyone of Solda Pool’s team members. From hardscaping & landscaping, to concrete forming, electrical, plumbing and gas, each of their crews paid attention to detail and genuinely cared about doing quality work. Solda took care of all the design plans and permit requirements with the city, and even the city inspectors commented that things are done the right way by Solda Pools whenever they do an inspection. Usually, the most important things in a construction project are the things you can’t see. Our project entailed putting in various retaining walls, acid etch concrete decks, along with a swimming pool (with water feature). There are no construction shortcuts with Solda – things are done the “right way” - everything is engineered to last. You pay top dollar with Solda, but you get quality, reliability and value. Nick was great to deal with over the course of our project. Thank you Gary! It was a pleasure working with you and transforming your backyard into an oasis. It looks amazing. Our pool/spa was installed in 1988 by Solda Pools in a very timely fashion and quality. Since then, we have used Solda Pools exclusively for all of our pool and spa service needs including yearly openings and closings. Due to the original excellent quality of our pool and equipment, our service needs have thankfully been minimal considering the 29 years we have had the pool. All Solda staff, including the office, on-site crew and service management have always been courteous, quick to respond, efficient, and have offered high quality that has been cost competitive. They take care in ensuring we are always pleased with their service. To this day, we are very pleased that we chose Solda and will continue using them for all our future needs. We highly recommend using the Service Team from Solda. Thank-you for your referral. Customers like you are a pleasure to work with. We strive to provide the best service possible in all our departments and your acknowledgement shows we are on the right path. Working with Solda from start to finish was so easy. From consultation to installation of patio and finally pool Solda employees were one step ahead planning and informing us of each step. They always appreciated questions we had and were flexible to making changes along the way. Their years of experience in the business were evident and their recommendations for our project were always appreciated. Also, the employees assigned to each phase of our project were very experienced and professional. The info package we received at the start laid out all contact info and steps to anticipate. When done, time was taken to answer any questions we had and if we had any problems , one phone call was all it took to get the support we needed. Thank you! We strive to make each project a seamless transition through each phase for our clients. 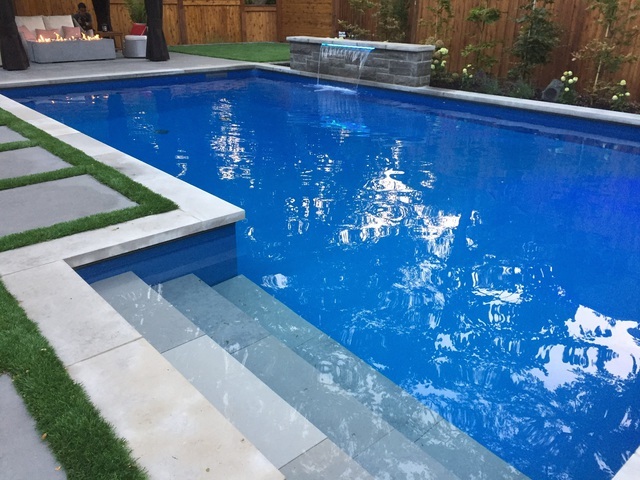 Our experience with Solda Pools was exceptional through every stage of the process. Their product quality and attention to detail exceeded our expectations. All staff, regardless of position within the company, were friendly, helpful and professional. As with most major projects, there were the inevitable issues that were quickly and creatively dealt with by Andrew Solda and his team. None more so that the supply of fencing on extremely short notice when our fence contractor (not with Solda) did not make their promised deadline. This quick action allowed our Canada Day 150 party with nearly 100 guests to still proceed as planned. 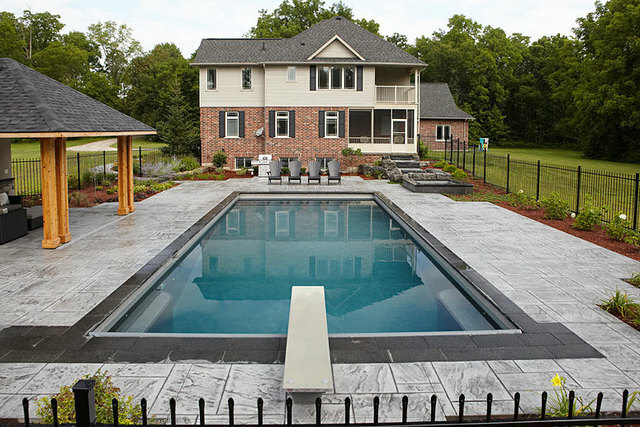 We would recommend Solda Pools to anyone in the market for a single source to design, build, and construct the pool of their dreams. Hello Len, Thank-you! 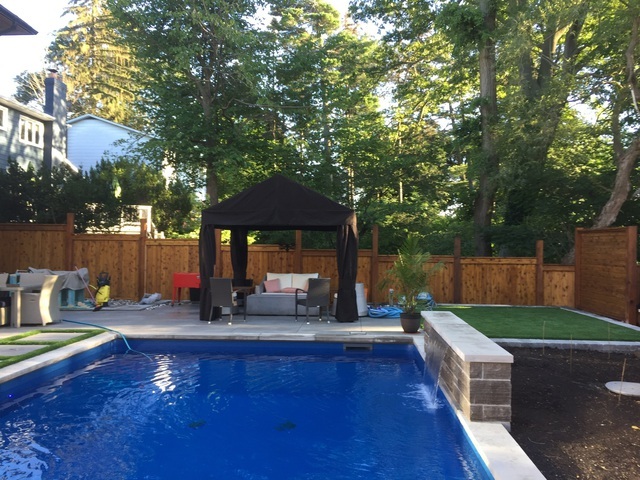 It was pleasure working with you on your backyard Oasis and so happy your Canada Day 150 party was a success. Enjoy! 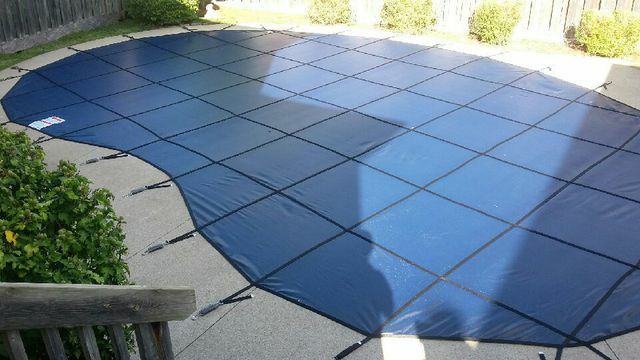 Replace swimming pool liner and install new winter safety cover. 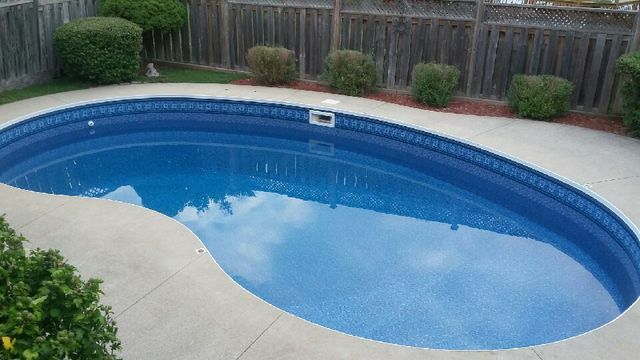 We contacted Solda Pools to replace an inground swimming pool liner and were very pleased with all aspects and in particular the attention to detail throughout the process. We also decided to invest in a winter safety cover which was a worthwhile investment. Great new liner choice! The safety cover offers such a clean look to the yard. Enjoy! 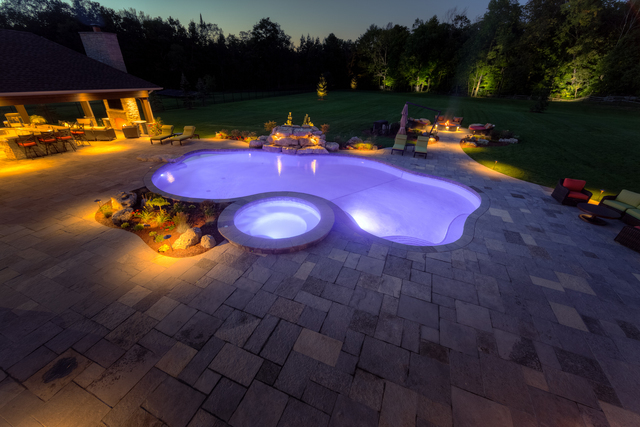 Solda Pools is an award winning, industry leading, turnkey custom pool builder serving the GTA area. They are family owned and operated since 1984. They provide a full turnkey package with their own in-house staff from design, through construction and finally to fully servicing the pool.